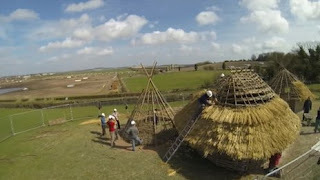 Inside, the project team has used a variety of different daubs, made of pig soil [dung] or chalk and straw and construction techniques that would have been used by the Neolithic people. "We've been trying a completely different way of thatching a roof. Nothing is tied onto the roof, as you would in a modern thatched building but the wheat straw that we've used is knotted and then tucked into a woven framework. "Often people think 4,500 years ago is a long time ago, which of course to us as modern people it is, but it's well into beginnings of agriculture. "We're looking at people that were farming, keeping cows and domesticating cereal crops, and of course houses were an important thing." The Neolithic huts will be kept for another two months and will open to the public during the two May bank holidays. The theory is based on the linear structure of the Cursus to the north of Stonehenge, which suggests that the biulders fo Stonehenge used a 365 day year and knew the size of both the earth and the moon.